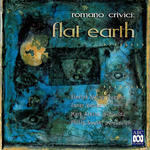 Flat earth / Romano Crivici. Withdrawn: the composer has withdrawn this work and it is no longer available for sale or public performance. Materials held in the Australian Music Centre's collection are for reference and research purposes only. Instrumentation: Violin, viola, sampler, percussion.